colours based on linseed oil have demonstrated their positive characteristics and have been in use over centuries. Linseed oil paints are permeable and thus prevent the wood under the paint from rotting unnoticed under the paint’s surface. Most linseed oil colours are weatherproof. Linseed oil has a small molecular size, so it penetrates easily deep into the surface on which it is applied to. In comparison to other types of colours, linseed oil allows the best possible adhesion. Linseed oil increases its mass density after it has been applied and therefore does not allow water to penetrate the wood’s surface. The wood is protected and does not rot. In addition, the paint’s own pigmentation provides protection against the ultra-violet radiation of the sun. Treating one’s windows and doors with linseed oil paints guarantees the best optimal care. Linseed oil also characteristically known for its elastic coating. On organic surfaces, linseed oil proves itself to be a big advantage. Wood adapts to the climatic changes in the environment. It shrinks or expands in accordance to the humidity conditions. In comparison to other plastic based paints, linseed oil can adapt to these changes largely without flaking or tearing, reaching an optimal isolation even between colour layers. oil on the surface of withering or rub it with a linseed oil soaked cloth. The surface appears fresh and is again protected for years to come. Linseed oil colours are available in every colour, every shade conceivable. Either modern or historical. Protect linseed oil colours protect and preserve wood best. It has been scientifically proven. In a Danish test trial, initiated by the local Danish painter Association, windows of a historically listed building, which were originally treated with commercial wood colours / wood preservatives, were then treated with (acrylic / alcohol based paints), including linseed oil colours. After 10 years (2012), the experiment was analyzed and showed both significant as well as convincing results. The windows painted with linseed oil paints had shown none to minimal defects. The colour surface and the underlying wood was in very good condition. Acrylic and alkyd paints, on the other hand, illustrated disappointing results. Even after a short time, brownish rust blemishes enveloped the window fittings and even the paint had begun to peel. Linseed oil colours, by the way, are also an ideal metal coating. A thin layer of linseed oil paint mixed with Zink or Iron provides an ideal sacrificial layer and thus the best rust protection. The paint prevents the ingress or penetration of water. After the sacrificial layer has been applied, the metal surface itself may be painted with every imaginable hue. This way it can be adapted to fit any individual need. Pure linseed oil colours are made of linseed oil and a paste of in oil grated pigments. To speed up the drying oil paints, one adds desiccants. Therefore linseed oil colours are almost entirely from natural raw materials and, above all, from a few and known ingredients. Pure linseed oil colours are free of resins and solvents. You can buy linseed oil paints in our Shop. linseed oil pastes are derived from in Linseed oil ground pigments. In order to produce a colour paste, pigments and linseed oil are triturated or mixed repeatedly with each other on a roller. The consistency is similar to that of an artist paint from the tube. Before the pastes can be used as a colour, it must be mixed with linseed oil and some desiccant. A spreadable finished paint is usually made of a ratio of 1: 1, a cup of colour paste per cup of cold pressed linseed oil. Since each pigment has different drying properties, the amount of desiccant that has to be added to the respective colour varies. Between 4-8ml per 1kg desiccant of paste to the finished colour should be added. For the proper instructions on the mixing of linseed oil colours, refer to the "Applications," section of this website. You will find additional information about working with linseed oil paints. A video of our Manufacturer Original Linoliemaling from Denmark can be found in our blog. The pastes, depending on their level of pigments contained, can be stored for years, remaining unchanged in their application properties and composition. The pastes can easily be prepared by mixing the necessary amount of linseed oil. Linseed oil paints are very plentiful. It is so easy to mix the pastes with the required amount of linseed oil. You can even do it right in your own home. The remaining paste may be stored away for later use. Highly absorbent surfaces require a larger amount of colour (meaning a higher proportion of linseed oil), low absorbent surfaces require more of a lean colour (higher paste content). This allows full control over the overall composition needed and get the most out of such a fantastic product. Linseed oil can be stored for up to -15 ° C.
You can buy our colour Pastes by visiting our Shop. Linseed oil has been used as a binder since the Viking era. Linseed oil paints, with their many positive characteristics, is highly convincing. Linseed oil is distinguished by its particularly good adhesion to almost all surfaces. It adheres to metals, wood and even plaster. Thus, it serves as a solid base should it be painted at a later date or after its application. Linseed oil colours are highly elastic. Linseed oil paints can be easily applied to previous oil paints. The tiny molecules of linseed oil penetrate the layers of previous paint layers and act as a great bond between these layers. This solid colour film is even permeable. Linseed oil forms a solid film by the oxygen uptake and oxidation. Thus, this process causes an increased weight density of up to 20%. If the film layer thickness is found to be too strong during its application or brushing, the ink layer may dry from the surface, thus affecting the wrinkles or folds and forms, leading to endless drying times. Almost all seeds and fruits contain fatty oils. Their quality and content of fatty acids are very different. Fat oils differ, roughly speaking, into two groups. The non-drying and drying oils. Only oils which, through oxidation on a normally non-absorbent surface, have the capacity to build an adhesive protective layer or solid film. The most common drying oils are: linseed, poppy seed oil, sunflower oil and walnut oil. Linseed oil is the fastest drying oil from all of the oils mentioned and, therefore, very suitable as a binder or bonding agent. The other oils are not only more expensive to produce, they also have significantly longer drying times than linseed oil. When used as a painting medium, linseed oil prevailed significantly over other drying oils over time. Linseed oil is won by pressing the ripened seeds of the flax plant. Only flaxseed plants containing 30-40% oil may be pressed. The purity, origin and growth conditions as well as the method of production shall ultimately determine the quality of the produced oil. Cold-pressed linseed oil only achieves a 20% yield. Cold-pressed linseed oil is clear and pale yellow colour. After pressing the seeds, the freshly pressed oil mucilage and aqueous components must be removed in order to avoid the unfavorable effect on the oil film’s drying capability and cause the newly produced oil to become sensitive to moisture. Tonkin varnish or Tung oil varnish is a varnish which is ideal for floors, stairs, Furniture and is suitable for all areas subjected to high traffic. It is an abrasion resistant, shatter-proof, durable paint that can be easily cleaned. It is also hypoallergenic. Tonkin varnish which is derived from the French term “Le Tonkinois” which simply means “suitable for wood surfaces,” and works best in places the must sustain permanent temperature changes and high humidity. The indoor climate will not be affected by the cured varnish coating. Today, even the French Navy uses Tonkin oil varnish in order to weatherproof their ships. You can purchase Our Tonkin Oil Varnish in our Shop. Linseed oil per se, even the boiled linseed oil remains relatively soft. If you are looking for a material that is resistant to abrasion, impact, and heightened subsequent variations in both temperature and weather conditions, then Tonkin varnish “Le Tonkinois” is recommended. Tonkin varnish consists of a mixture of refined linseed oil as well as Chinese Tung oil. Tung oil, also called Chinese wood oil ensures the durability of linseed oil. Tung oil, itself, is a vegetable oil obtained by pressing the seeds of Tung or Abrasion trees. This oil oxidation is similar to linseed oil, except that it hardens quicker, thereby forming a rather resinous, harder surface. When both linseed oil and Tung oil are combined the result is luster, or shine, as well as a resistance to high traffic contact resistance. Indoor and outdoor Tonkin oil varnish is an ideal solution for all types of wood. It preserves the surface and warmth of the wood it is applied to, even under harsh weather conditions. The application of Tonkin oil upon light-wood surfaces, one should note that the Tonkin oil enhances the wood’s natural golden-yellow inherent color significantly. “Le Tonkinois” is ultra- violet or UV-resistant, as well as non-fading and easy to use. It is free from aromatic, ethereal, and chlorinated solvents, but also includes benzene as a dilute. Paints with Tonkin oil have a shiny appearance or glow. The gloss level can be heightened, intensified or even adjusted simply by sanding it with fine- grained sandpaper. The addition of the matting agent “Gelomat” allows Tonkin oil to achieve its satin- like appearance or matt gloss. 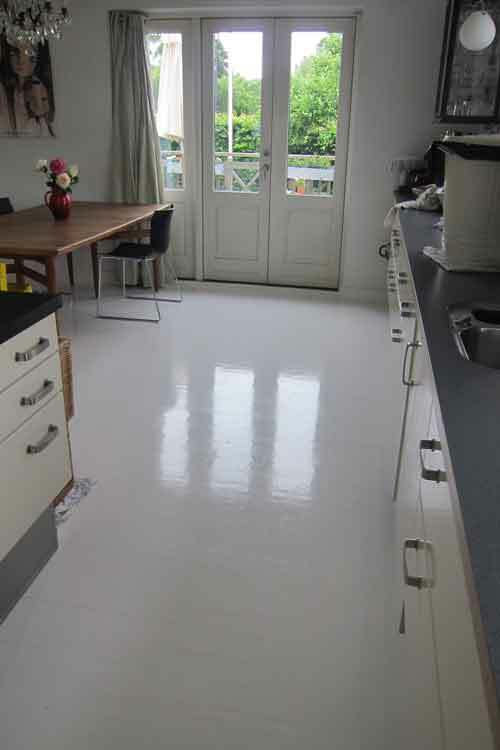 Tonkin oil has proven itself as a wood preservative, floor and marine paint. However, Tonkin is also ideally suited as a protective coat for metals. Depending on the substrate or surface and conditions, up to 2-4 coats may be required. Tonkin oil becomes dust-dry after only about 2 hours, bonded or hardened after 8 hrs. A second coat may be applied after only 24hrs. “Le Tonkinois” lasts on average for up to 20m2 per liter. For other Application notes and tips, refer to the “Applications” section of this Website. Are you in search of “living colours” which naturally change their hue? Then try painting with Limestone colour. In Scandinavia the Limestone colour surface treatment was the most popular facade treatment for both old and new buildings over the past 20-30 years. The yellow whitewash has a characteristically warm rust yellow hue. Over time, the hue changes, it becomes a darker “washed effect” or "flames" on the wall’s surface. As a result of moisture in the air, limestone colour will become “reddish-brown” in its overall appearance over time. Thus, it will constitute a beautiful mix of the hue levels achieved in the same colour. Depending on the mixing ratio of the lime as well as the moisture conditions in the masonry, the Limestone colour can vary. Limestone yellow used as lime paint differs from other whitewash types in the fact that the yellow Limestone layer is chemically produced. The addition of green crystals (ferrous sulfate) in lime is a new colour scheme. Usually one would add lime whitewashing pigments, thereby determining the colour of the lime coating. Limestone paint behaves differently than coloured lime. If you mix the lime with Limestone, the result is a green mixture. After applying this mixture on the wall surface, it changes its colour from light green to rusty brown. Upon drying, the colour then produces a warm yellow appearance.